Open access databases publish their articles and research for free on the web and do not require authentication with your student portal credentials. The Library links to select open access databases, in addition to our subscription content collections, to help provide to you the broadest scope of scholarly materials possible within a single search point. 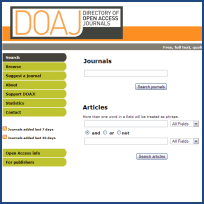 DOAJ offers links to full text, quality controlled scientific and scholarly journals, covering all subjects and many languages.